First of all you need to have your PowerPoint presentation made. As you make the slideshow give some thought to the size of the font you are using and try and keep it fairly simple. 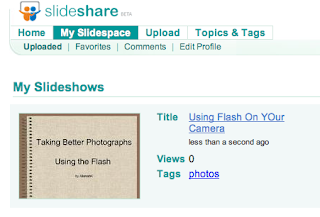 Go to Slideshare Website and register using your Gmail address and password to keep things simple. They will send you a confirmation email to respond to. 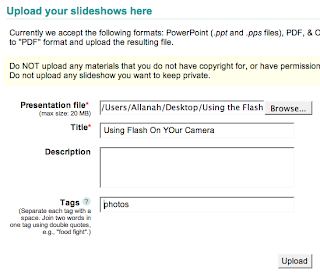 Browse to your Powerpoint presentation and upload it. When it is done you may have to wait a few moments before it is converted. Click on your presentation and you will see a box on the left where it says enbed in your blog and click on the html code to select it. Copy and paste it into the new post and there you are!